As I’ve mentioned before, I like to know how people come across any and all books they read. While having lunch the other day with two amazing women blessings and discussing my weekly three-hour drives to see a loved one, they suggested I listen to audio books while travelling in the car. Eureka! The last time I can recall listening to audio books was when I drove three hours from grad school to home, which is a long time ago. Thus, I was anxious to explore the offerings at our local library. My squirts, now pros on two wheels, and I hopped onto the bike trail across the street from our house and found our way to Glen Carbon Centennial Library (in one piece, I might add). Here I explored nearly four rows of books on cd, a welcome increase in selection from years past. A foodie at heart, the title which caught my eye was Sloane Crosley’s I Was Told There’d Be Cake, a New York Times bestseller. A compilation of essays told in Crosley’s own voice, this was the ideal reintroduction to audio books for me. I didn’t have to remember a cast of characters or settings. Instead, I only had to hone in on one nonfictional account at a time ranging from the mystery of the bowel movement found on the rug in her small New York bathroom to her near death experience with hemochromatosis (yes, I didn’t know what this ailment was before listening either). Crosley’s careful manipulation of words made me giggle aloud as I waited in my lane for prescriptions to be filled or checks to be cashed. I even found myself more than a tidy bit miffed when the GPS lady interrupted as I was trying to drive to a new-to-me locale. 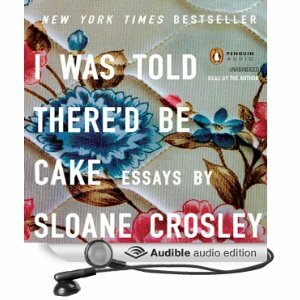 So, if it has been a while since you have listened to an audio book or never tried one before, pick up Crosley’s I Was Told There’d Be Cake and listen to her straightforward story told in her own words. Time to find something exciting to listen to so hubby doesn’t get the yawns as we drive to FL . Andy moves one more time with the Navy. Best of all is this move is for SHORE duty. No more deployments! Yeah! Glad to hear no more deployments. When are you going? Now I have to look up hemochromatosis! !